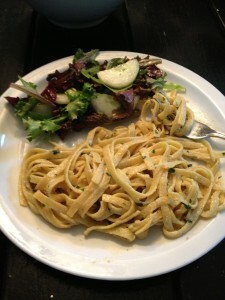 Home › Posts Tagged "vegan fettuccine alfredo"
This one’s mine! Because let’s face it; sometimes you just need some creamy, cheesy goodness. Which is fine… unless you’re vegan (or trying to be as much as possible, like us). I came up with this one after testing nutritional yeast as a cheese substitute in another recipe. After some initial skepticism, I was pleasantly surprised by its cheesy, slightly-nutty Parmesan flavor and even more surprised by the whole new world of vegan dishes it opened up. Plus, it’s super easy, fast, and requires very few ingredients. Boil noodles according to package direction. While they are cooking, mince garlic. Reserve four cups of pasta water, then drain noodles. 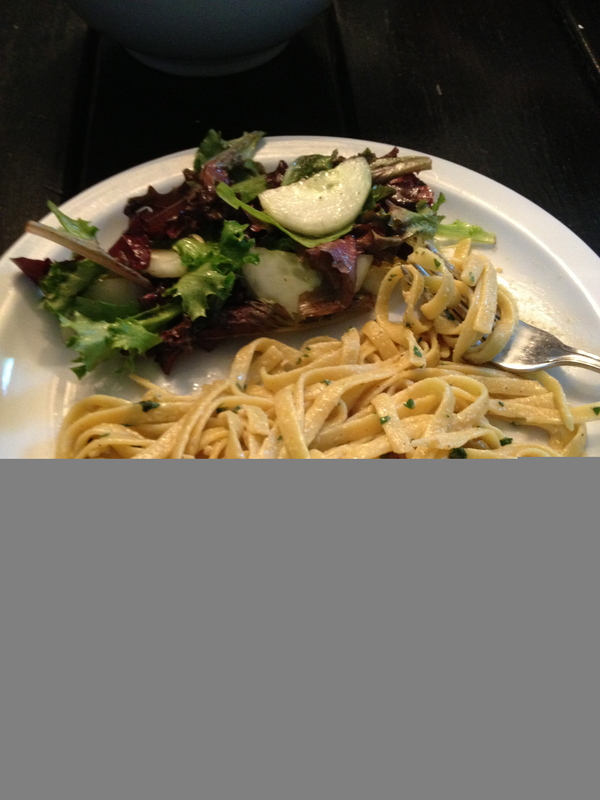 Heat 2 tablespoons olive oil in pasta pan and saute garlic for one minute. Reduce heat to simmer and add noodles to pan with yeast, basil and an additional 1/4 cup olive oil. Add a little of the reserved pasta water and stir until heated through and well blended. Keep adding reserved pasta water to get the dish to a “creamy” consistency. When you have it where you want it, season with kosher salt and fresh ground pepper to taste.